Home – Original – AquaNation Inc. The first theme ever with a built-in system for geolocalized information: build anything from an awesome travel blog for your trips, a travel agency website with holiday tours or just about anything that needs a beautiful customizable and interactive Google maps! Bloggers, travel agencies, and more! Anyone that needs to display geolocalized information will find in Voyager the perfect tool to build amazing and unique websites thanks to its powerful built-in page builder. Discover all the theme features and find out why Voyager is the right theme for you! Behind every great theme, there’s a ton of exciting features! Create amazing trips with an interactive Google map. Do you like to travel and tell others about your trips? Create a beautiful & unique blog, geolocalize where have you been in the world, and elegantly show pictures from your excursions out in the wild with ease! An example of a summer trip, with blog posts associated to the trip and automatically generated galleries. An example trip detailing where you went skiing last winter, without the need to create posts for it. Illustrate beautiful itineraries to sell to your customers, create engaging city trips or describe all the features of your resort. Use “Voyager” for your business thanks to the power of the built-in page builder, and its custom-made pricing table content block. A travel agency promoting a tour around beautiful greek islands. While still using geolocalized information to generate the map, the page is composed with the built-in page builder. 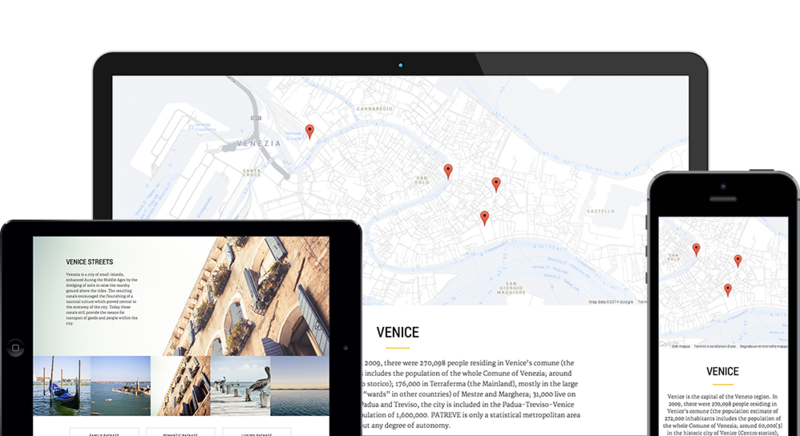 An example of how an agency might illustrate a city tour, highlighting and describing relevant city information and points of interest in romantic Venice using the built-in page builder.